Hinduism: A Contemporary Philosophical Investigation explores Hinduism and the distinction between the secular and religious on a global scale. According to Ranganathan, a careful philosophical study of Hinduism reveals it as the microcosm of philosophical disagreements with Indian resources, across a variety of topics, including: ethics, logic, the philosophy of thought, epistemology, moral standing, metaphysics, and politics. 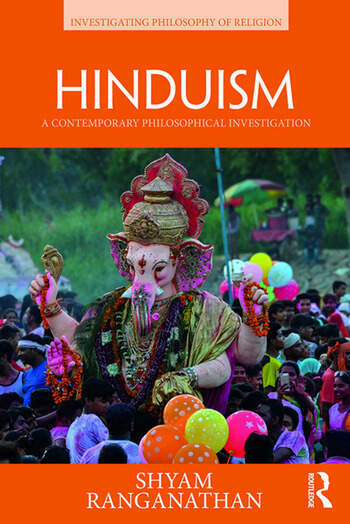 This analysis offers an original and fresh diagnosis of studying Hinduism, colonialism, and a global rise of hyper-nationalism, as well as the frequent acrimony between scholars and practitioners of Hindu traditions. This text is appropriate for use in undergraduate and graduate courses on Hinduism, and Indian philosophy, and can be used as an advanced introduction to the problems of philosophy with South Asian resources. Shyam Ranganathan is a Faculty Member of the Department of Philosophy, and a Research Associate at the York Center for Asian Research, York University, Toronto, Canada.